Two iconic characters like Luke Skywalker and Darth Vader are born commanders—forged by fate, nature, and experience to lead others into battle or on difficult missions. Yet while both may fill a similar role on the battlefield, they could scarcely be more different. Luke, a selfless hero of the Rebellion, calls upon his Jedi training and knowledge of the living Force to illuminate a path forward. Darth Vader, on the other hand, is consumed by the dark side and its teachings of anger, hatred, fear, and ruthless independence. Both Luke Skywalker and Darth Vader are commanders of your armies in Star Wars™: Legion, and each has a unique approach that only they can bring to the table. 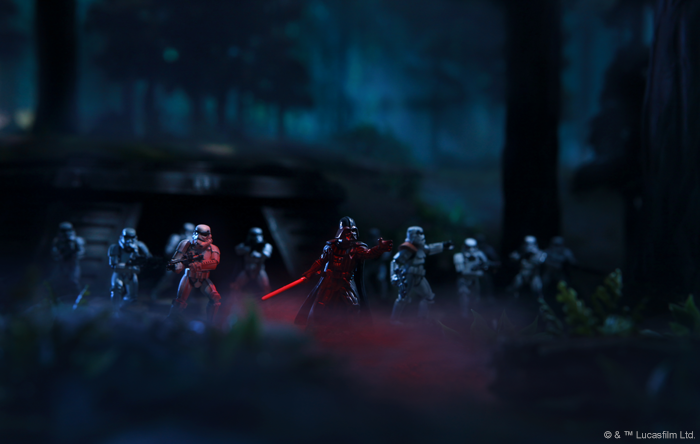 Over the last few weeks, we’ve taken a closer look at the armies of the Galactic Empire and the Rebel Alliance in the Star Wars: Legion Core Set. Before that, we looked at the game’s challenging, innovative command system built on command cards and issuing orders a select few of your units. 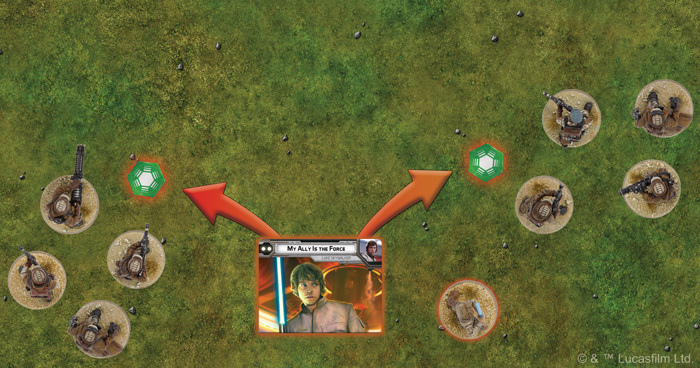 Today, we bring those two aspects of gameplay together for a closer look at Darth Vader and Luke Skywalker’s unique command cards in Star Wars: Legion! 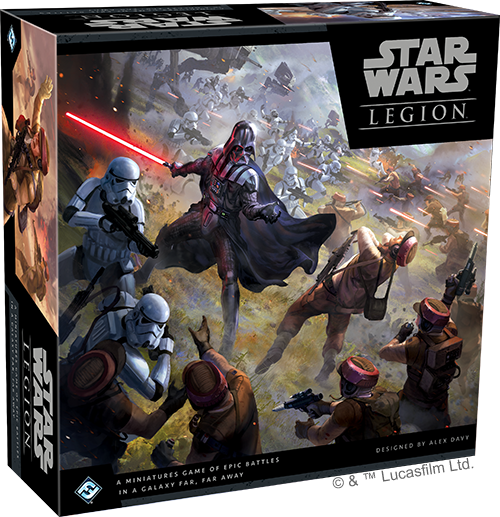 The Star Wars: Legion Core Set comes out on March 22nd, along with eight supplemental expansions! You can pre-order your copies at your local retailer or online through our website today; then, read on for more information. 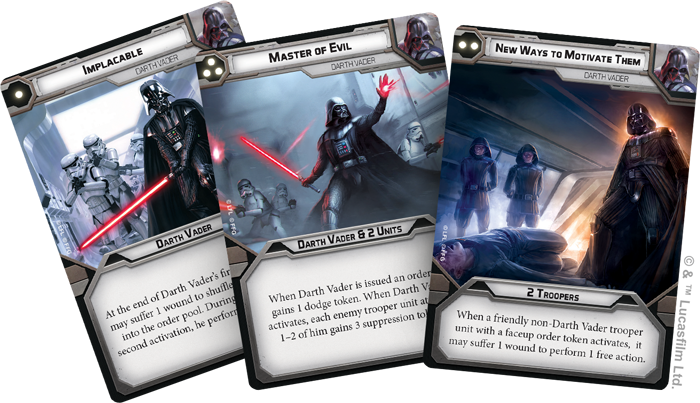 In Star Wars: Legion, each player will have a hand of seven carefully chosen command cards. These command cards must be selected before the game begins, as part of building your army. (We’ll take a closer look at army building in a future preview of Star Wars: Legion!) At the beginning of the round, you’ll secretly choose one of your command cards and reveal it at the same time as your opponent. 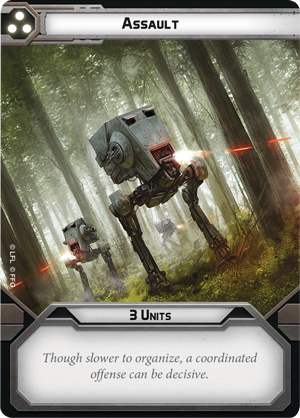 These command cards determine which player has priority for the round and how many orders you can issue to your units—for a much more detailed overview of the command system, you can read our preview here! Four of the command cards included in the Core Set are neutral, and can be used by any army, regardless of faction. These cards are: Ambush, Push, Assault, and Standing Orders. Each of these neutral command cards is quite straightforward. A faster card, like Ambush, gives you a better chance of winning priority, but only allows you to order a single unit. 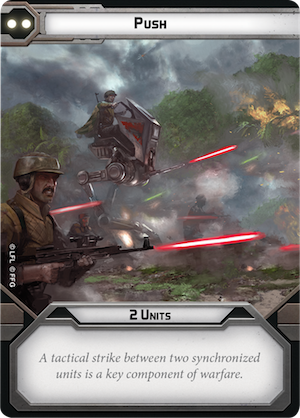 On the other hand, a card like Assault is slower, but lets you issue orders to three units! The exception is Standing Orders. This command card is slowest of all and only orders one unit… but you can return it to your hand at the end of the Command Phase. All other command cards can only be used a single time during the game. If you don’t want to potentially waste one of your command cards by playing it too early, Standing Orders can let you keep all of your command cards and bide your time. The neutral command cards can make a useful foundation for your army’s command structure—but the more critical and impactful command cards come from your commanders. 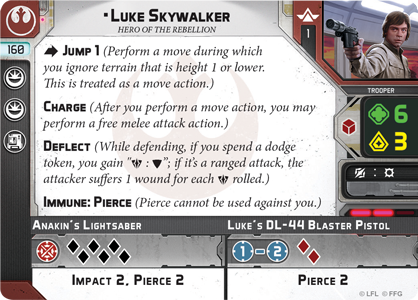 Every commander in Star Wars: Legion has three personal command cards that come with him. So long as that commander is included in your army, you have the option to use his command cards: just one more way to bring the spirit of your commander into your games. Darth Vader’s power as a warrior cannot be overstated. Between his mastery of the dark side and his skills with a lightsaber, Darth Vader is capable of cutting through dozens of Rebels with uncanny ease—as we’ve already seen in the final scenes of Rogue One. 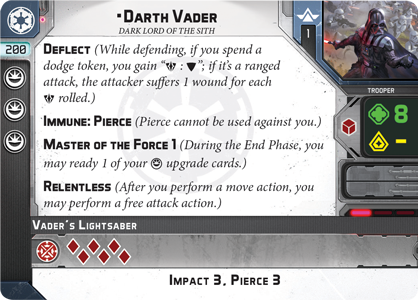 Still, Darth Vader is also a potent commander, using tactics honed during the chaos of the Clone Wars, and those strategies are reflected in Darth Vader’s three personal command cards. Perhaps Darth Vader’s greatest weakness in your games of Star Wars: Legion is his low speed, which can make it difficult for him to come into range to use his lightsaber to devastating effect. Darth Vader’s fastest command card, Implacable, offers you a way to counter this. When playing Implacable, you have a very good chance of going first, letting you rush forward with Darth Vader and charge into the fray. 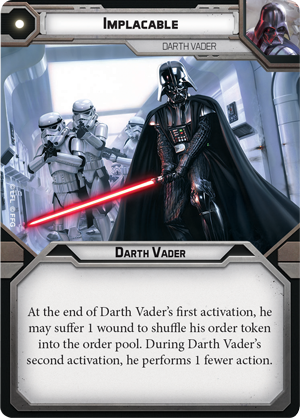 In fact, to your opponent, it might seem like Darth Vader is unstoppable—at the end of his activation, Darth Vader can suffer a wound to shuffle his order token into the order pool, gaining a second activation when you draw his order token. Though he can only take one action on his second activation, that’s more than enough for Darth Vader to move and attack with his Relentless ability. While Implacable brings the spotlight of the battle onto Darth Vader, you can focus on the rest of your army with New Ways to Motivate Them. After all, Darth Vader is perfectly willing to make an example of a few troopers in order to inspire greater results from the rest of his army. New Ways to Motivate Them lets you issue orders to two trooper units, and whenever one of those units would activate, it may suffer a wound to perform one free action! 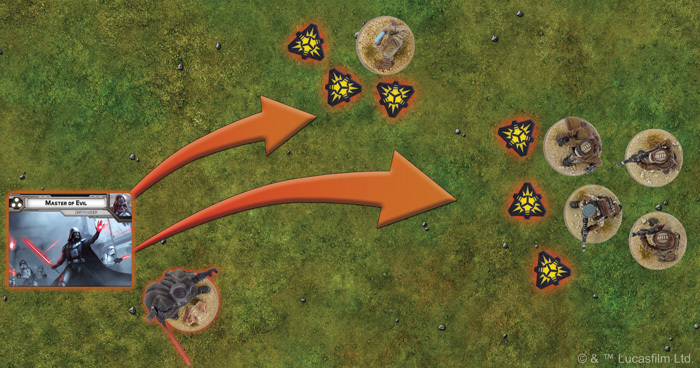 Losing a figure from your unit is never easy, but if it means your units can move, aim, and fire in a single activation, the impact could be more than worth it. Finally, you can bring the true power of the dark side to bear against your opponent with Master of Evil. 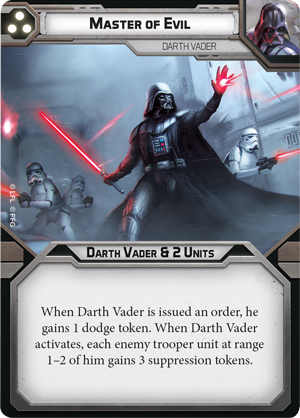 While this is Darth Vader’s slowest command card, it gives you the most orders: issuing orders to Darth Vader and two other units. Master of Evil instantly grants Darth Vader a dodge token, keeping him ready to Deflect any incoming laser bolts. In fact, the sight of Darth Vader can be so daunting that your enemies may turn and flee as soon as he comes near. 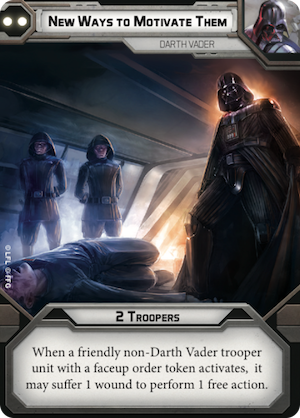 Master of Evil also forces each enemy trooper unit within Range 1-2 of Darth Vader to take three suppression tokens when he activates. As we saw in our combat preview, suppression tokens can force enemy units to cower in fear and lose actions—or even break and flee for the edge of the battlefield. 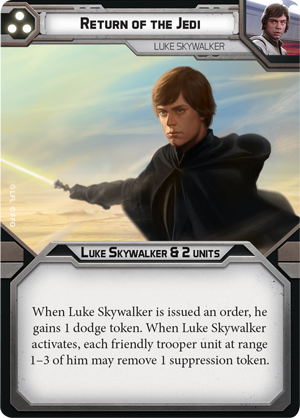 Both Luke Skywalker and the Rebel Troopers unit will take three suppression tokens when Darth Vader activates because of Master of Evil. 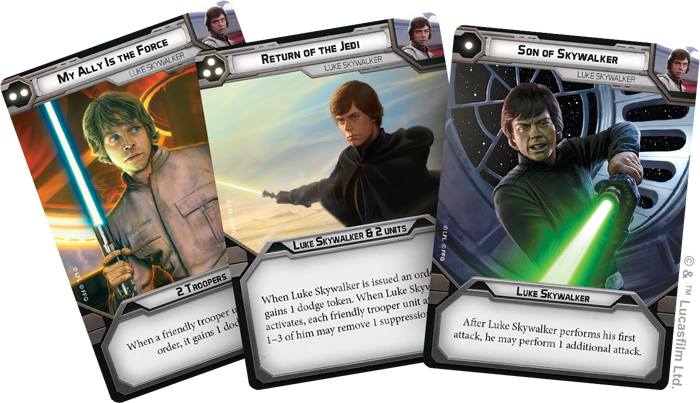 Like Darth Vader, Luke Skywalker comes with his own complement of three command cards, beginning with Son of Skywalker. 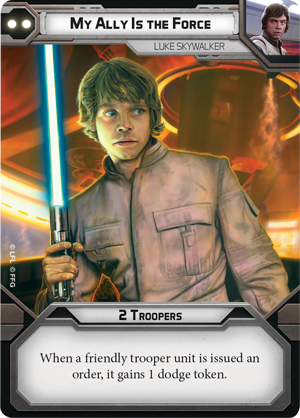 If you need to send Luke Skywalker leaping into combat to cut down an AT-ST or a squad of Stormtroopers before they can activate, Son of Skywalker is the perfect command card. It gives you a great chance at winning priority, and after Luke Skywalker performs his first attack, he can immediately perform an additional attack. 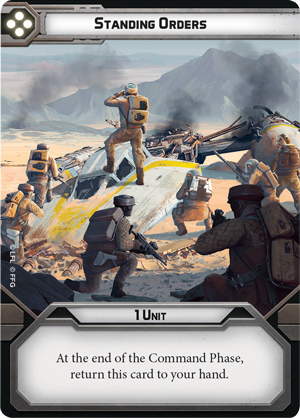 Of course, the downside of this card (as with Implacable) is that you can only issue an order to your commander, leaving the rest of your army without orders at the beginning of the round. Still, the amount of damage that you can pump out with two attacks from Luke Skywalker at the top of the round can certainly outweigh the lack of direction for the rest of your army. You may use the power of the Force to protect the other units in your army with Luke Skywalker’s second command card, My Ally Is the Force. 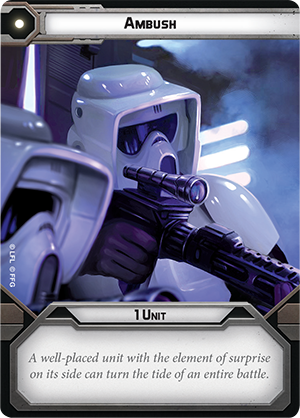 This command card can issue orders to any two trooper units, and when those orders are issued, your units also gain a dodge token. 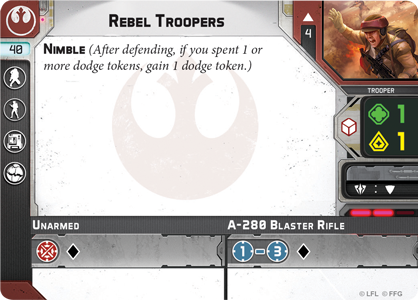 Dodge tokens make your units more difficult to hit, and the Rebel Troopers' Nimble ability makes them a natural target for My Ally Is the Force. Luke grants dodge tokens to two units of Rebel Troopers with My Ally Is the Force. Luke Skywalker’s final command card is Return of the Jedi, and in many ways, this card is a reflection of Darth Vader’s Master of Evil card. Return of the Jedi is also a slower command card that lets you issue orders to Luke Skywalker and two other units. 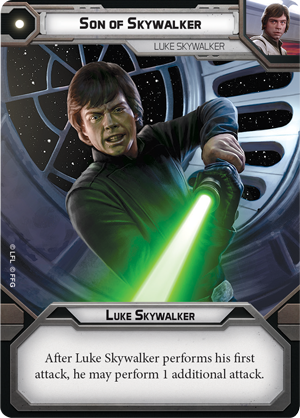 It immediately grants Luke Skywalker a dodge token, activating the Deflect ability that he shares with Darth Vader. The difference is that whereas Darth Vader inflicts fear by dumping suppression tokens on enemy units, Luke Skywalker’s heroic presence lets you inspire your own troops. 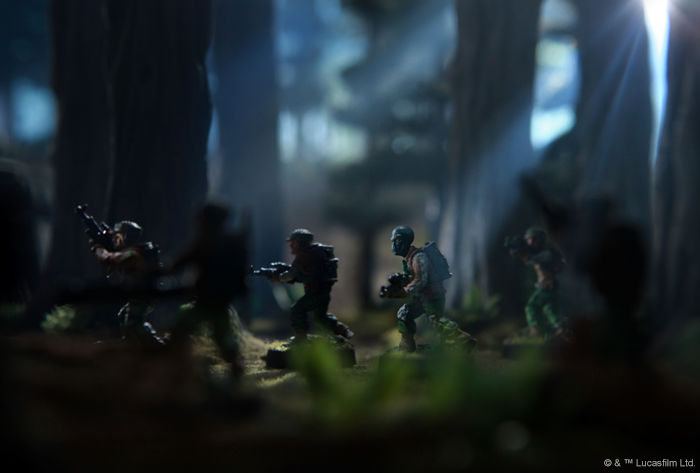 Whenever Luke Skywalker activates with Return of the Jedi, your nearby troopers can remove a suppression token, keeping morale high and your soldiers ready for action. You may swear your allegiance to the Galactic Empire and smash freedom wherever you find it. Or, you may take up arms with Luke Skywalker and Rebel Alliance, fighting to kindle the flame of hope once more. No matter which side you choose, your commands are integral to claiming victory in your games of Star Wars: Legion. Look for the Star Wars: Legion Core Set to release alongside eight expansions on March 22nd! You can pre-order your copies at your local retailer or online through our webstore today.